Tuesday, January 29th. There have been 27 ratified amendments to the U.S. Constitution over the past 225-plus years, but that total comes with an asterisk. Uniquely, the 21st Amendment repeals the 18th, which began its short career this month in1919. That amendment launched the Prohibition Era, a well-intentioned act of social hygiene, seeking to ban the availability of alcoholic beverages. The unintended consequences, though, were perhaps worse — vast flouting of the law by the public and a boost to organized crime. 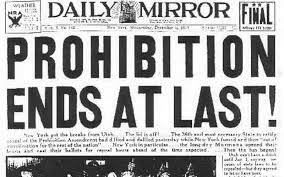 Prohibition was repealed in December 1933. In the no-longer-dry United States, there are 716 distilleries and over 2,800 breweries, with combined annual sales of about $43 billion per year. Profile America is in its 22nd year as a public service of the U.S. Census Bureau.